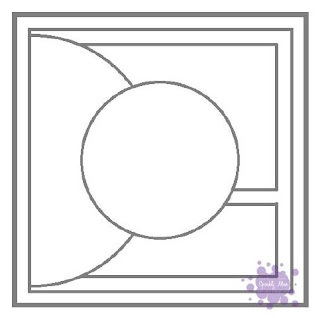 I used the Joyful Jars stamp set from Get Inky! Stamps, available here. 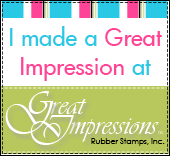 These stamps are wonderful to use -- they stamp crisp and clean and clean up beautifully, time after time. This card was so fun to create. I started with Glitz Designs Vintage Blue 6x6 papers. The card base is 6 1/2 x 5 as the jar itself is so large, in order to fit the flowers on the layout, I needed larger than the standard A2 size card. 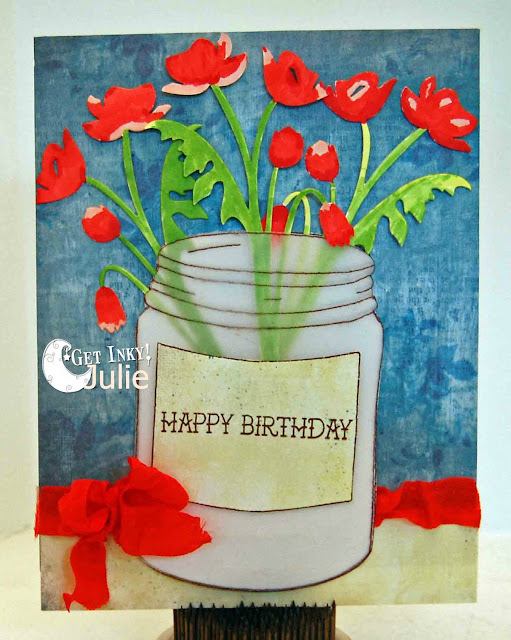 I stamped the jar on white cardstock and fussy cut it. I stamped it again on vellum and fussy cut again. 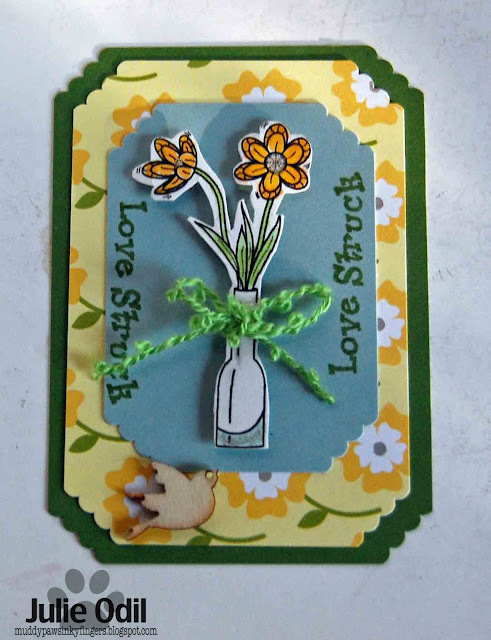 I stamped the label stamp on a light colored yellow Glitz DP and fussy cut that, then stamped the sentiment on it. The flowers are a Spellbinder poppy die. I ran white cardstock through my Grand Calibur 3 times, then colored the flowers with Copic markers, using the back side of one of the flowers. To assemble the card, I started with the layer of blue DP, and a bit of yellow at the bottom because the paper was 6x6 and the card was 6 1/2 inches. Then, I ran a layer of Scor-Tape, and semi-pleated some 3 Girl JAM red ribbon from the new Red, White, and Blue bundle. Next, I attached the white jar to the base of the card. Then, I arranged the flowers how I wanted them, gluing them down when I liked the look, and using foam tape on the middle clump to add dimension. I added the vellum layer over the stems so they'd look like they were inside an actual jar or vase, then added the label with the sentiment to the top. Lastly, I tied a double bow out of the same red 3 Girl JAM ribbon. 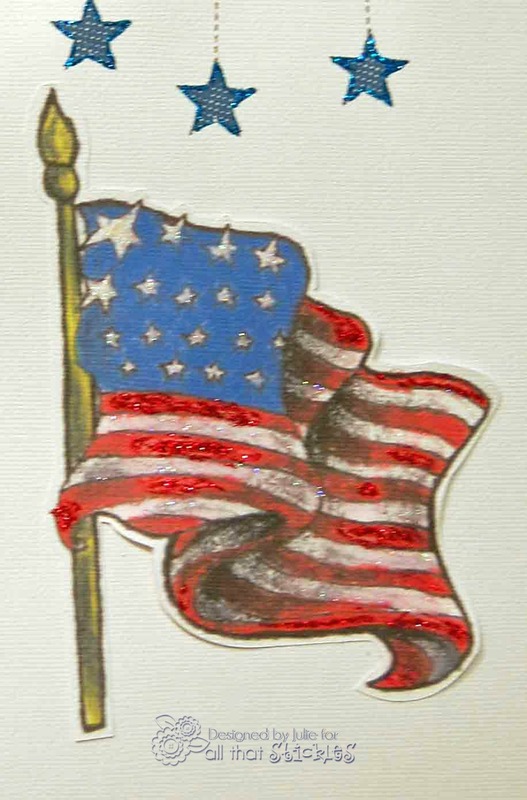 And, that's my red, white, and blue card for the current Get Inky! Challenge! Hope you like it! 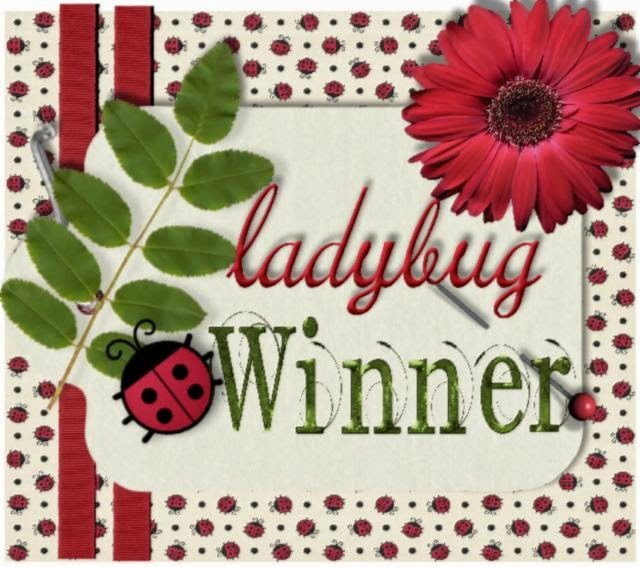 It's a Red, White, and Blue Blog Hop with Joy's Life! Julie: http://muddypawsinkyfingers.blogspot.com -- you are here! Dawn: http://dawnmercedes.blogspot.com -- go here next!! I found a really fun star shaped card in the Silhouette store that I thought would work perfectly with today's patriotic theme. I used the Joy's Life "My Hero" Stamp Set. Isn't it perfect for this card? There are many sentiments on that set that work well for any patriotic holiday. It's a "gotta have" set! I'll tell you a little about the other products I used, too. The red card stock base is cranberry cardstock from Close To My heart. The patriotic patterned papers are from my friend Tabitha. She designs digital papers, and even takes special orders. You can find her papers and digi stamps at Tabitha's Designs. The crinkle ribbon, by 3 Girl JAM is from the new Red, White, and Blue bundle. This is the white ribbon, with red and blue edges. Scrumptious, isn't it? Then, there's the chipboard from UmWow Studios. My friend, DeeDee makes it, and it's wonderful. This chipboard is the star confetti. The pearls are from Close To My Heart. That's it for me. Time to hop along to Dawn's blog and see her wonderful creation. Have fun, and thanks for stopping by! Feeling Patriotic for the Craft Lovin' Challenge Blog! 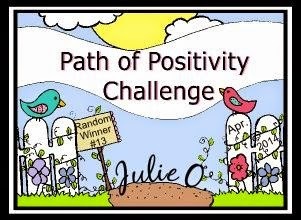 If you are looking for the Joy's Life Blog Hop, please click here! Happy Saturday, everyone! Here we are, almost the end of June already! 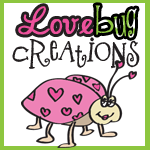 The Craft Lovin' Challenge Blog, sponsored by Tabitha's Designs and My Crafting Channel, has been in existence for nearly a month now and we're on to challenge #3. 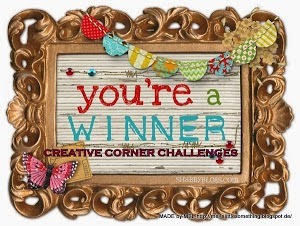 Did you win one of the great prizes in the Anything Goes challenge? Check the 'Winners Tab' to know for sure. 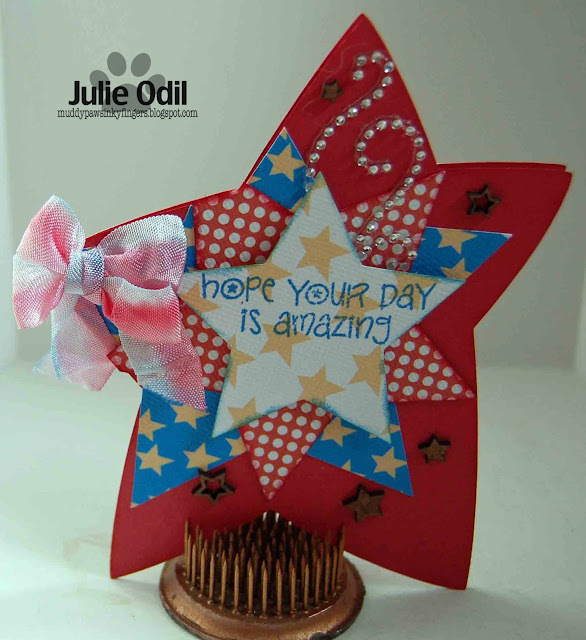 I had a great time making this star shaped card. 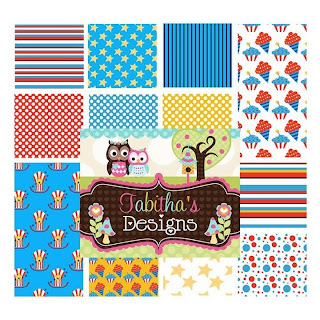 The papers are all from Tabitha's Designs. They are the 4th of July papers. I imported them into the Silhouette Software, then used the print and cut feature for the star shaped card and the individual stars. Patch, the bear, is a digi stamp from Tabitha's Designs. He was colored with Copic Markers and fussy cut, then placed on foam tape for some dimension. 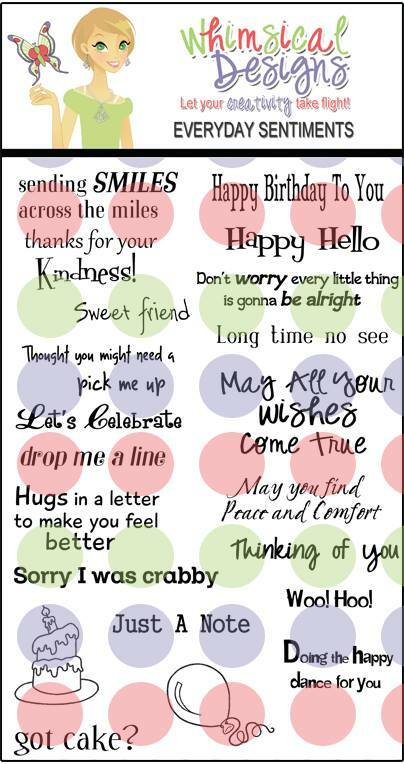 The "Let's Celebrate" sentiment is from Whimsical Designs. 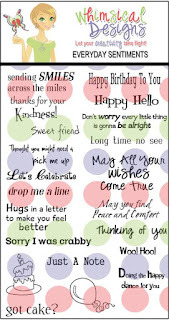 It is from the Everyday Sentiments Stamp Set. Come link up those patriotic projects and win some of our great prizes. We've got terrific sponsors! You have until July 12th. 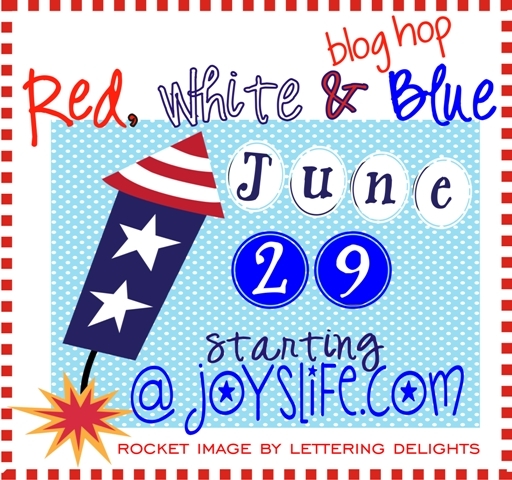 If you are looking for the Joy's Life red, white, and blue Blog Hop, please click here! It's time for some mid-term inspiration on the All That Stickles blog. 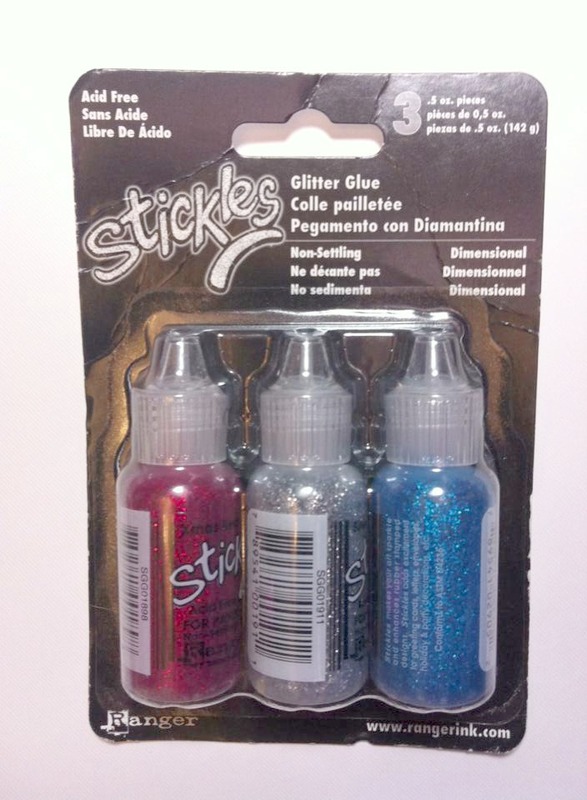 We're currently linking up Firefly Stickles and it's a great color for summer -- bright and (of course) sparkly. 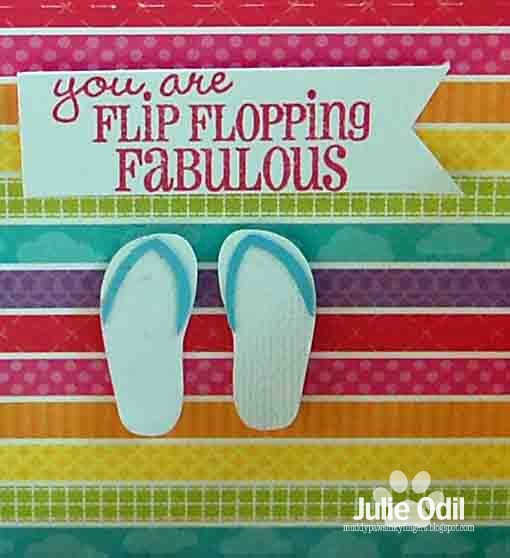 I have a fun, somewhat sassy card to share with you today. It's a perfect match for Firefly Stickles! Isn't she fun? I used the sentiment from one of our June sponsors, Bugaboo Stamps. The girl is a Unity Fashionista stamp, Claire. I used just the bottom portion of the stamp for this card. I colored her with Copic markers. The fringe of her skirt and her shoes use the Firefly Stickles. Last Saturday started with a call from the facility where my father lives. They found him sitting in a chair and he was "not himself" The nurse felt I should take him to the emergency room. After 5 hours of testing, they discovered pneumonia. He was scheduled for discharge Tuesday. Then, Tuesday morning, multiple blood clots were discovered in his lungs. He will not be able to return to his apartment right away. When he leaves the hospital, he will go to a nursing home for (hopefully) a short stay to get off oxygen and get some strength back. Trying to be with him while juggling work AND some time for crafting has proved interesting. I'm very glad it's the weekend! I made this card last weekend to send to our local veterinarian and his staff. And so you, my dear FWF audience, get yet another post referring to the death of my dog, Molly. I wanted to send a thank you to the vet's office along with the bill for the services that day. They truly went over and above what they would have had to do. I drove 3 hours across the state so Molly could see her own vet. They worked us in as soon as we made it to town, even interrupting a surgery to accommodate us. So, a heartfelt thank you card seemed the least I could do to show my gratitude. Of course, I had to use a Golden Retriever on the card, making it look as much like my Molly as I could by coloring it with Copic markers. This is actually very close to her coloring. These papers were in a grab bag, so I don't know what they are. If anyone recognizes them, please let me know. The ribbon is from the Seasons blundle from 3 Girl JAM. The bling is from Close To My Heart. 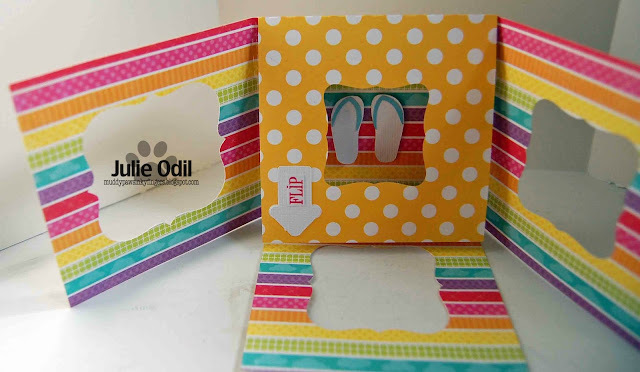 I used a Lifestyle Crafts Circle die in two different sizes for the circles on the card. The stamp, of course, is Unity. It's a Unity/Phyllis Harris co-branded stamp Brandy and Emma: Forever Friends. I had planned to link up, but missed the deadline because of the ER visit. So, I saved it for FWF. Have a great weekend, everyone! Sometimes I make a card and think, "oh well, it'll have to do." Sometimes I make a card and absolutely love it. Today's card falls into the "I absolutely love it" category. She just makes me happy with her sweet smile and bright outfit. The image and sentiment are from Sparkle Creations. Her name is Watermelon Rin. The crinkle ribbon is, of course, 3 Girl JAM, and it's the Cherry Lipstick, from the Pink and White Bundle. I used American Crafts Amy Tangerine Sketchbook 6x6 papers on this card. The image is colored with Copic markers. I used a Spellbinder Gold die, and sponged the paper with Tim Holtz spun sugar distress ink while still in the die, concentrating on the edges of the paper. The bow is popped up on a Vintage button, also from the 3 Girl JAM store. That's it for me today. I hope you can visit my blog this weekend. I'm posting again tomorrow, and I have 3 posts on Saturday! 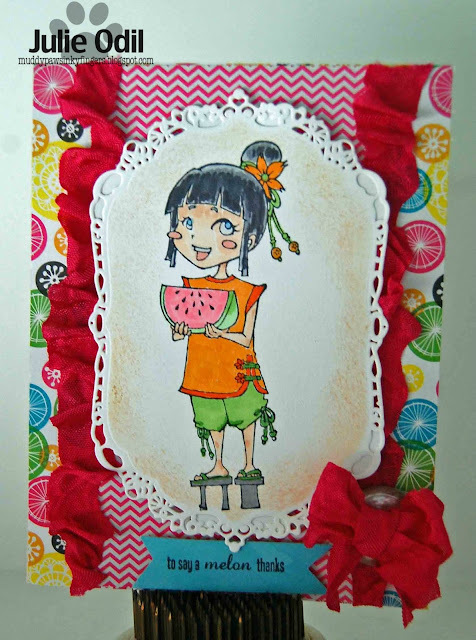 It's challenge time on the Whimsical Designs blog, and this week's theme is ATC's. I love making and trading ATC's. I think they are one of the most fun things I've experienced since starting this hobby. 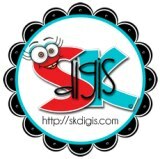 SK Digis has some adorable stamps. Check out their website here. I love how well this vase looks against the background. Isn't it charming? I used Whimsical Designs stamps. I love that I can find a stamp for any occasion. 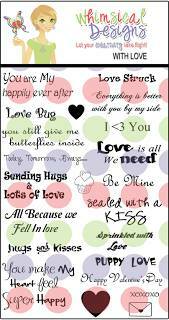 This stamp is from the "With Love" stamp set. 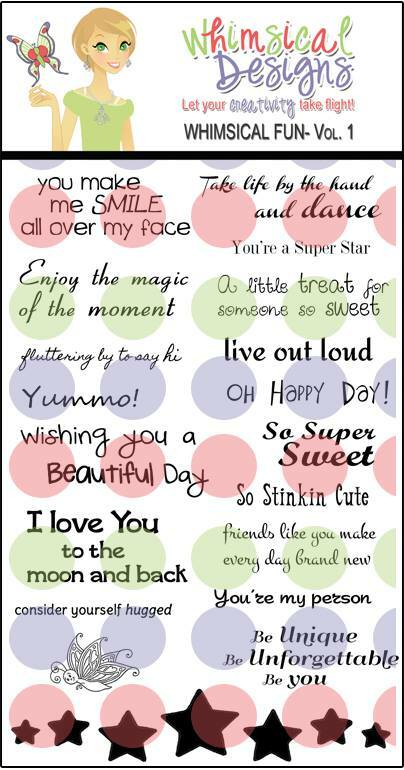 You can buy all the wonderful stamps in the Whimsical Design store. I used Pebbles Happy Go Lucky 12x12 papers on this, colored my image with Copics, then fussy cut it. The bow is some retired threads from Close To My Heart. I used a We R Memory Keepers cloud corner chomper on each layer. The wood bird is also from Close To My Heart. Come join the ATC challenge on the Whimsical Design blog. You have two weeks. 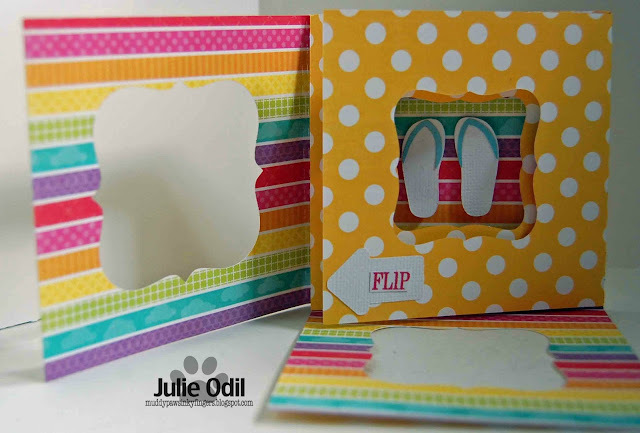 Here's the front of the 4-flap nesting window bracket card, cut on my Silhouette Cameo. I used the Joy's Life Pun in the Sun stamp set found in the Joy's Life store. 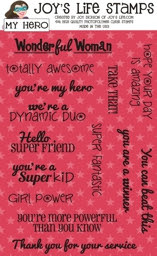 and, the inside of the 4 layer bracket window card, with the sentiment inside. The flip flops were also cut out on my Silhouette. They can be found here. The arrows were cut out on my Cameo, too. The "flip" is part of the sentiment. I stamped the whole sentiment, then cut the part I needed, gluing it to the white arrows. Here's one last picture, a close up of the fun sentiment. I used Echo Park Summer Days 12x12 paper on the card, and American Crafts white cardstock. The "flip"s and sentiment were stamped with Close To My Heart tulip ink. I had a great time making this card. I hope you enjoy it! I want to thank all of you for you kind, sweet, touching comments on the loss of my dog, Molly last week. You touch my heart greatly, and helped in the healing process. Thank you for letting me use this FWF platform to share my grief. Thank you for your understanding. 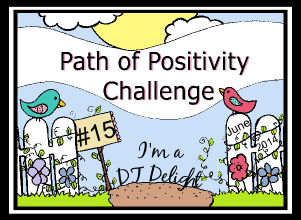 This week's post will be more upbeat, I hope! 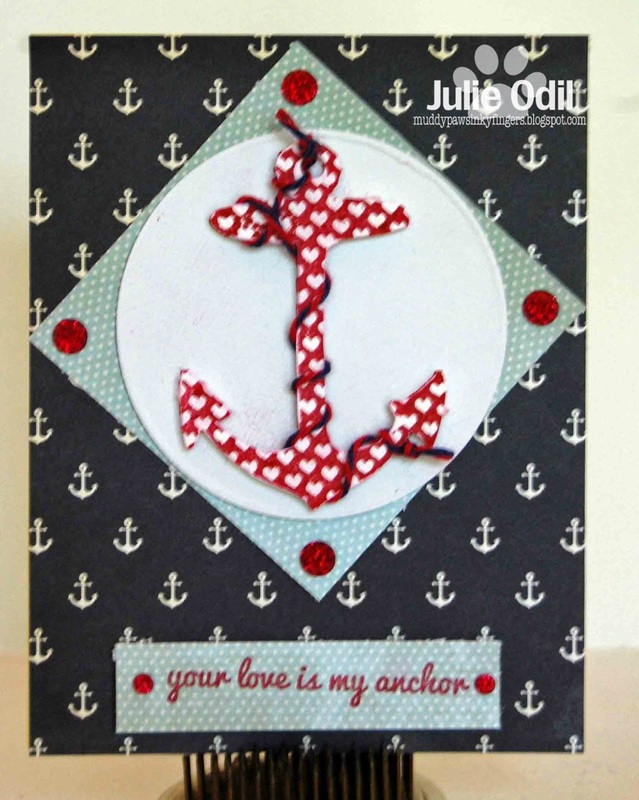 The anchor image and sentiment are both a Unity stamp of the week. I fussy cut the anchor, wrapped it in some Berries Jubilee Trendy Twine, and used foam tape to mount it. The designer papers are Fancy Pants By the Shore 6x6. I used a Lifestyle circle die to get that perfect circle. The red bling is from Close To My Heart. I think that's it for me today. There's a few red, white, and blue challenges I'm going to link this up with. Have a great weekend! Hello, everyone! 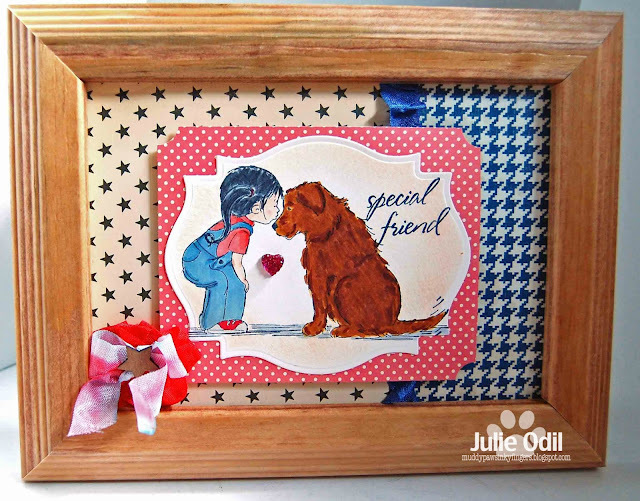 Today's my first design team project for Cameo Creations Challenge blog! I'm determined to learn everything I can about this incredible machine, and what better way to do it than by working with the super talented ladies on the Cameo Creations design team? The challenge for the next two weeks is a patriotic one. I found the star box cutting file in the Silhouette online store. If you'd like to try it, you can find it here. I used My Mind's Eye American Made 12x12 papers on the box. 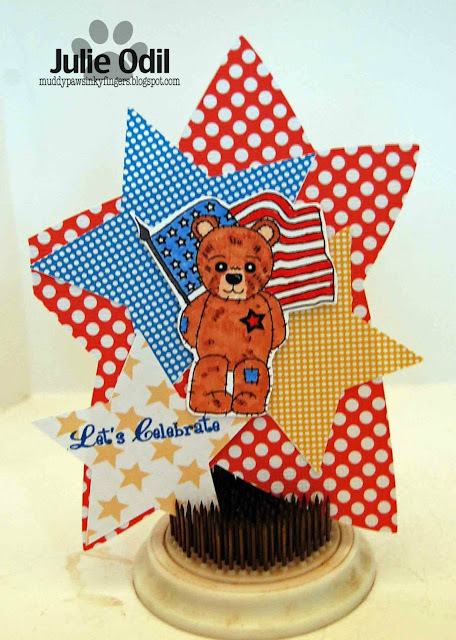 It was then stamped with a variety of Unity star shaped stamps from various stamp of the month kits. 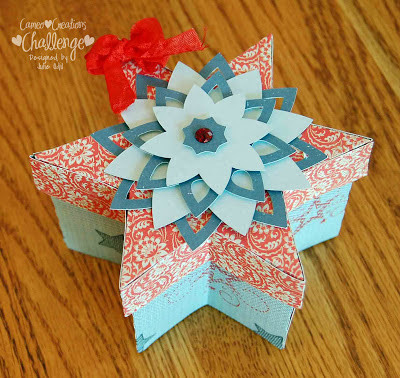 The layered star flower, also from the Silhouette online store, was cut out using Echo Park wintertime cardstock. Rhinestone bling, and 3 Girl JAM crinkle ribbon in red, from the brand new red, white, and blue bundle finishes off the project. That's it today for me. Now it's your turn! Join us with your 4th of July projects. You have two weeks! 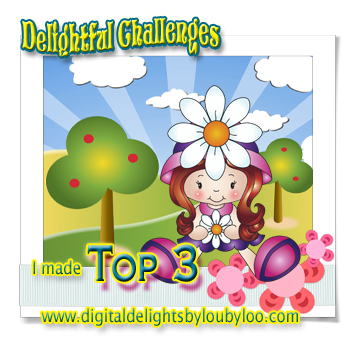 There's a new challenge starting today on the Whimsical Design blog. Yes, it's Whimsical Wednesday already! This week's theme is "Getting Patriotic" and it's sponsored by Eureka Stamps. 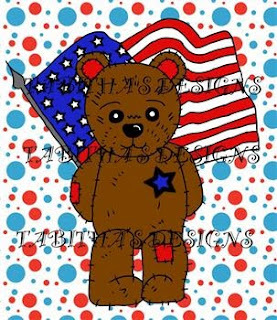 The star shaped flag is a digi stamp from Eureka stamps, colored with Copic markers. The star shaped card is a download from the Silhouette store, found here. 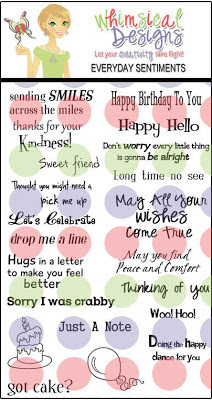 I did a masking technique to get the "Let's" and "Celebrate" sentiments separate from each other, and then cut the stamped images into the fishtail shape. 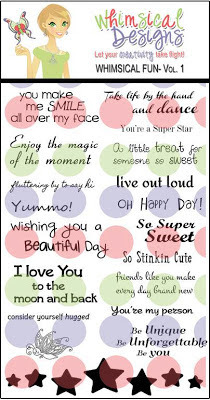 They are from the Whimsical Designs Everyday Sentiment stamp set. I cut the card out at 5 inches, using Close To My Heart tulip cardstock. I added some UmWow Studios star confetti chipboard for the finishing touches. You have two weeks to get those patriotic projects made. I want to see them on the Whimsical Designs blog! 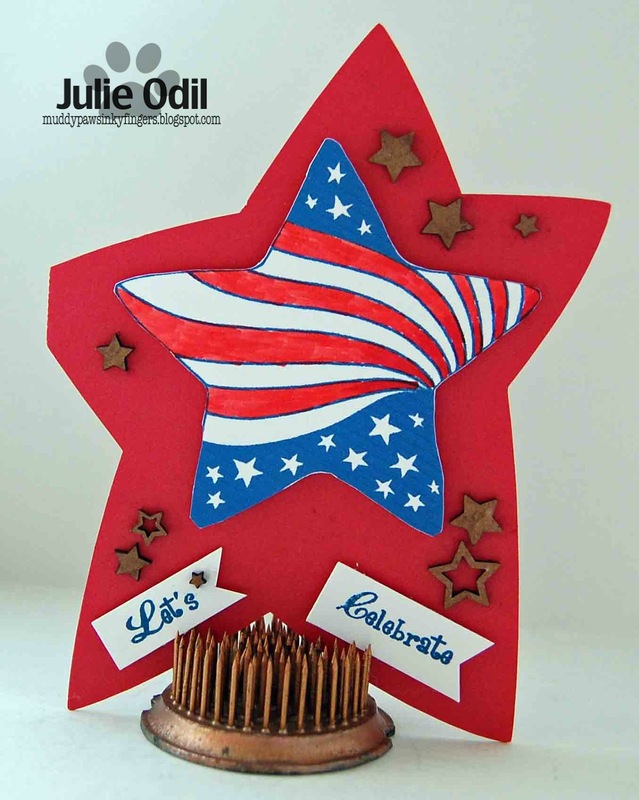 Welcome to the Star Spangled Blog Hop brought to you by the All that Stickles design team! 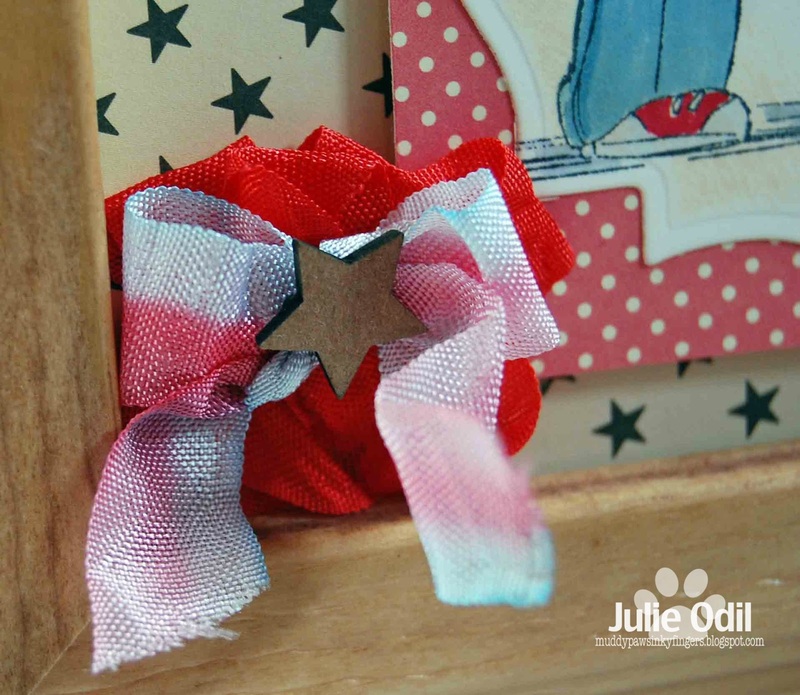 In non-musical form: Today the All that Stickles design team has created a variety of patriotic-themed projects using our favorite sparkly embellishment - Stickles! 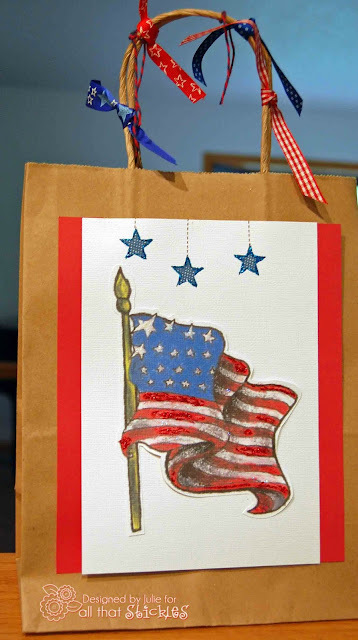 There are many birthdays celebrated amongst my family and friends right around the 4th of July, so for my project today, I made a Patriotic gift bag. It makes you want to put your hand over your heart, doesn't it? We have blog candy for those who are a follower of All that Stickles and leave a comment on every stop of the hop! 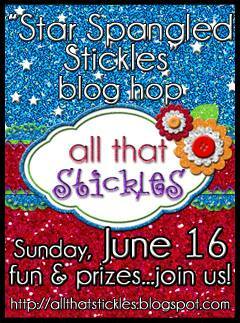 Winners will be announced Wednesday June 19th at All that Stickles. Thanks for hopping! :) Don't forget to check out our Distress Stickles Linky Party! Make something awesome and link up to win our fab prizes! Now hop on off to Chas' blog -- I love her work! 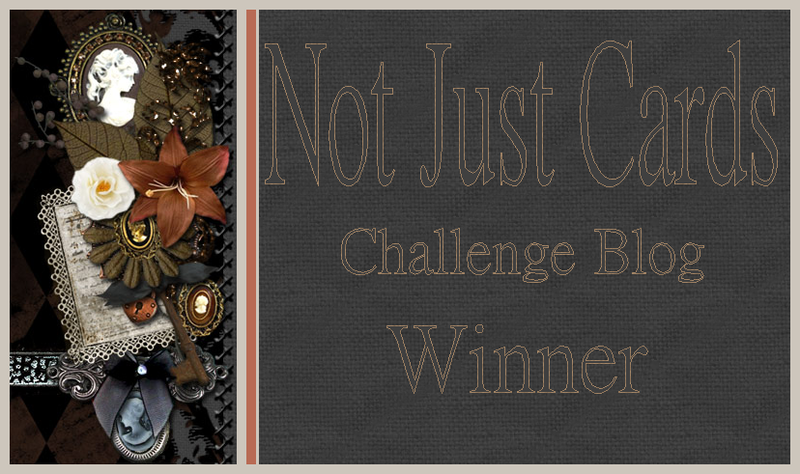 It's Challenge Time at the Craft Lovin' Challenge Blog! Come join us for the second challenge at Craft Lovin' Challenge Blog. This time the theme is a popular one -- Anything Goes! My inspiration for this one is a card, and I used several products from our sponsors. 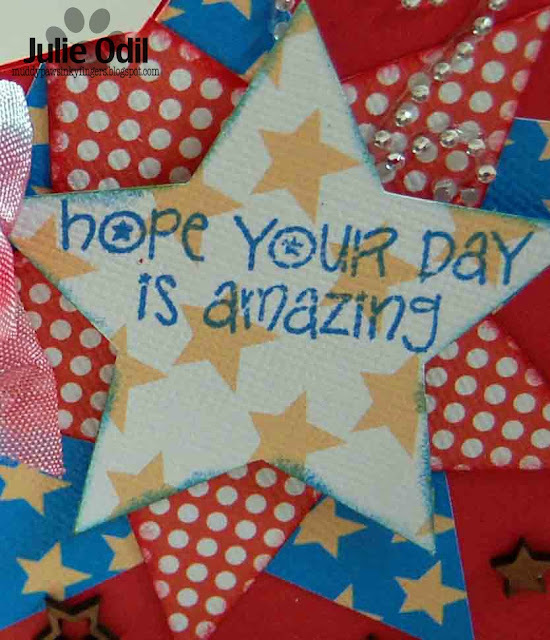 I used a digi stamp from Crafty Sentiments, and digi paper from Tabitha's Designs. I cut the beehive shape out on the Silhouette, using a file from The Cutting Café. The bear was colored with Copic Markers. 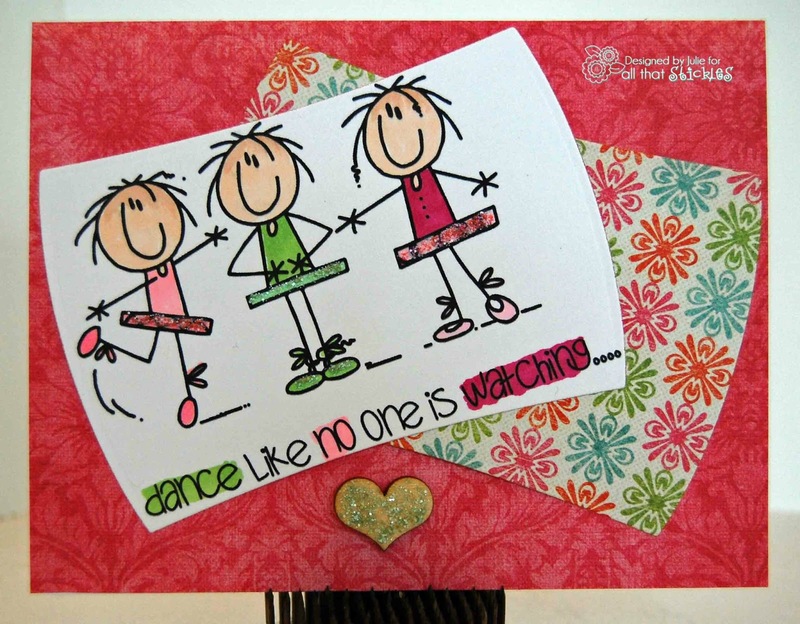 The sentiment is from Whimsical Designs Stamps,"Whimsical Fun Volume 1" stamp set. I used crinkle ribbon from, of course, 3 Girl JAM. It's the Tuxedo from the Celebrations bundle. The small twine bow is twine from Timeless twine. It's the Cape Cod twine, with yellow and gray together. Link up in our Anything Goes challenge at The Craft Lovin' Challenge Blog. You'll have until June 28. There's great prizes to win from our sponsors! I'm hopping today with 3 Girl JAM. You should have arrived from Kendra's blog. We're celebrating a special birthday of Julie, the owner's, sister. And, we're celebrating some fantastic new red, white, and blue ribbon. For me, though, this post is going to deviate from the birthday theme. It is my chance to share my news and celebrate a special life well lived. Those of you who follow my blog regularly and who hop with me each week with Friends With Flair may remember my post from last week. I was heading across the state with my 3 dogs to stay with my BFF. Well, we made the trip, but the day we got there, my 12 1/2 year old Golden Retriever, Molly, got ill. She got sicker and sicker as the day and night went on. By the next morning, I cut our visit short and returned home, knowing her end was near. I wanted my husband to have his opportunity to say good by to our Golden girl. She died last Thursday, being held and told by both of us that we loved her very much. I hope when my time comes, I am as lucky to die in the arms of a loved one, with a loving voice in my ear. In honor of her, I got out one of my favorite Unity/Phyllis Harris stamps, and started the therapeutic process of creating something in her memory. Here is my "Molly Art". 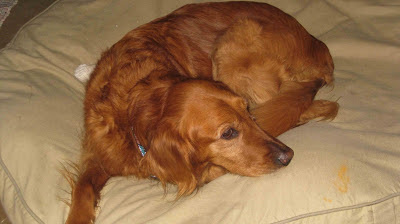 Molly was a very dark colored Golden. She was sometimes mistaken for an Irish Setter by people who didn't know their breeds real well. I worked hard on this to get her color just right. She had just a touch of gray around her eyes and under her chin so I tried to get that in, too. And she was my special friend, so that's the sentiment I used. The girl is no one in particular. Molly loved people. It wouldn't have mattered to her who this girl was -- Molly would have loved her. Molly wagged her tail at everyone -- even cars driving by. She absolutely loved people and attention. One of the things my husband is missing the most is Molly's kisses. She gave the gentlest kisses in the world. That's the reason I chose this particular image to stamp. Molly and her gentle kisses. Yeah. We both miss them. I used October Afternoon papers on this (Hometown and Fly a Kite) and made it 5x7 so I could frame it. The stamp is Unity/Phyllis Harris "First Love". The ribbon is, of course 3 Girl JAM, and it's the newest, prettiest, gotta have ribbon -- the Red, White, and Blue bundle. Here's a close up of the ribbon flower I made. There is a sale going on to launch this new ribbon bundle, so make sure you check out the store this weekend! Isn't that ribbon beautiful? I love the streaking in the white. So fun! The chipboard star is from UmWow Studios. 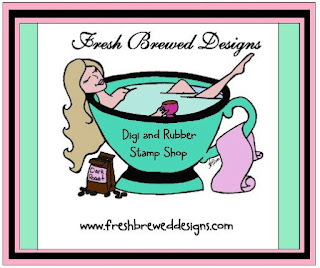 My friend, DeeDee has many innovative products you need to check out at her store. I used a Spellbinder label die and the heart bling is from my stash. I used a We R Memory Keepers Corner Chomper, too. I rarely remember to list the Copic markers I used on this, but this time I did. Here they are: The dog was colored with: E99, E39, E18, and YR23. The bib overalls: B93, B95. Shirt -- R24, R27. Shoes -- R27, R29, C1. Skin -- E11, E00, E000, R20. Hair -- C3, C5, C9. I have some pictures and a few memories of Molly to share, but I realize that not all of you may want to hang with me for that long, so I'm going to give you the hop order here, and send you on your way if you want to hop along. 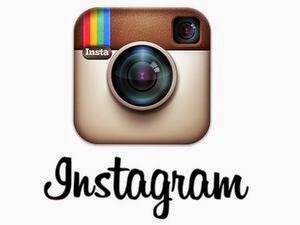 If you want to stick with me and see my pics, I'd love to share a few memories with you. Rebecca- http://bloomingpink.blogspot.com/ -- go here next! Molly loved to play ball. She was obsessed with it. The last day that we were at Sheri's, she wasn't feeling well, wanted to play ball, but was having difficulty. She collected everyone's tennis balls and laid on them. If she couldn't play catch, she didn't want anyone else to, either. Here's a couple pictures taken of her that afternoon. Molly's vet said her kidneys shut down on her. We had that happen to the first Golden we had - years ago - too. It is hard to have her gone, but she lived an incredible life. She was healthy, happy, an athlete. She was full of love, full of energy, never lacking for attention. She was slightly quirky, somewhat timid, always, always loving. I miss her everyday. I will leave you with a couple of my favorite pictures of my silly Molly. Here she is, resting on her pillow. She could be a real lounge lizard, especially in her later years. And, finally, a picture of the whole family, taken last Fall, shortly after Sophie came to live with us. Sammy is on the left, Sophie in the middle, and Molly St. Valentine is on the right. That's Shaun with all 3 of them. 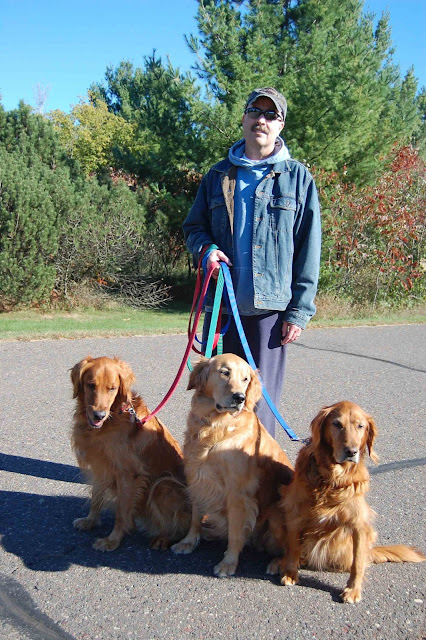 He loved walking them together. Thank you for allowing the chance to share a few precious memories and to let my blogging friends know of my loss. A big thank you to Julie K for her understanding, allowing me to deviate from the birthday theme today to pay my tribute to Molly. I'm hosting a challenge this week at Crop Chocolate contest blog, Cocoa Creations. The theme, in honor of Flag Day, is Red, White, and Blue. 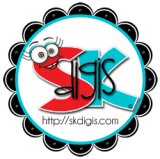 Make a project of any sort using at least 2 of the 3 colors and link up with us. You can win a bag of scrappy goodness (USA) or a gift certificate to an online retailer of your choice (Canada) for your creation. I will be submitting this project in the challenge. Now, hop on off to Rebecca's blog and see what artistic goodness she has to inspire you with today. Wednesday -- hump day -- and, since I've joined the Whimsical Designs team, new challenge day. It's Whimsical Wednesday over on the Whimsical Designs blog. 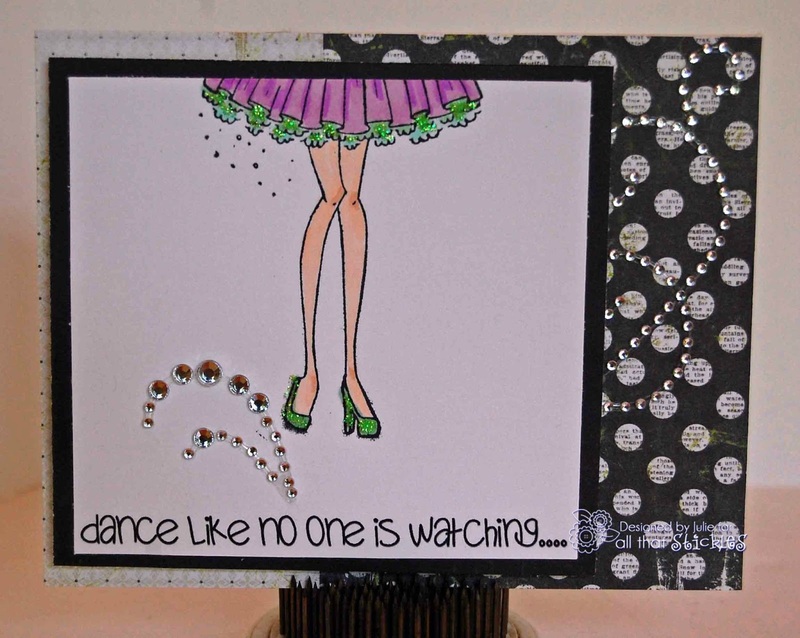 You'll love all the inspiration there from my fellow DT sisters! I used 2 stamp sets on this card. Everyday Sentiments has the "Let's Celebrate" sentiment, and I used the adorable delicate butterfly on Whimsical Fun - Volume 1 to add character to the background paper of the sun. 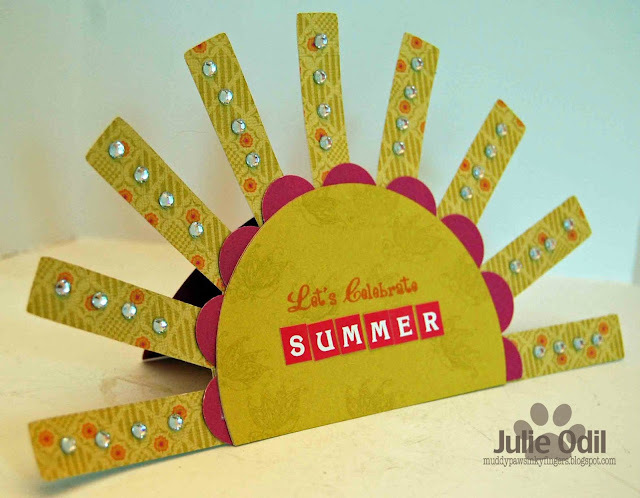 The sun shaped card is a cutting file from the Cutting Café. 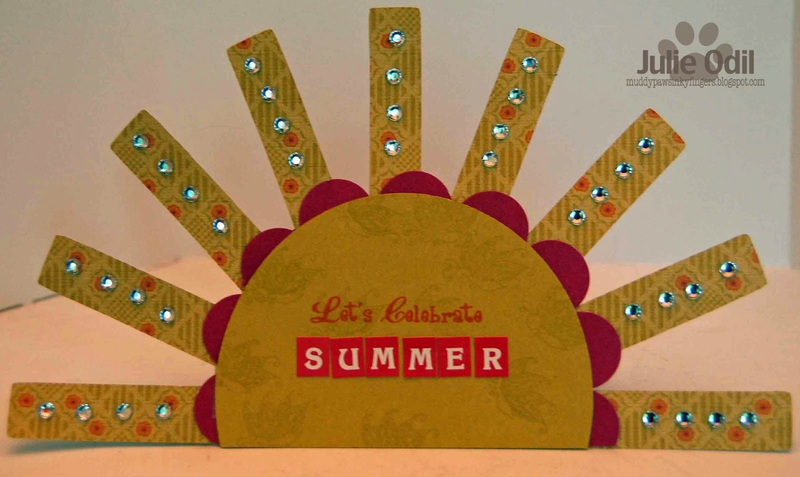 I used a circle punch to add the scalloped looking border to the sun. Papers are from Close To My Heart -- a retired paper line called Flirty. The rhinestones are also from Close To My Heart. Our sponsor for this week's challenge at Whimsical Wednesday is Fresh Brewed Designs. The winner will receive 3 digis of their choice. What are you waiting for? Summer goes fast enough! Make something summery and link up with us!